The city of Tendō sits on a wide plain in the Yamagata prefecture of North Eastern Japan. It's a city of just 61,000 people and, with snow-topped peaks visible in nearly every direction, feels even more distant from Panasonic's headquarters in industrial Osaka than the 600km (370 miles) that actually separate them. But this quiet spot, hemmed-in by the Iide, Ōu and Asahi mountain ranges, plays an essential role in the company's camera business, as it's home to Panasonic's Yamagata lens factory. It makes other things, too, but we visited because it's responsible for lens units for compact cameras, interchangeable lenses, and lens elements for both Panasonic and other (un-named) customers. The factory was founded in 1982 and has been making lenses since 1987, giving it 35 years of experience in the field. But, the company maintains, it's still constantly looking for ways to improve. All of the images in this article were supplied by Panasonic and are used with permission. It's fascinating how every company wants to convince DPR readers that its products are made in Japan even though they say, "Made In" Vietnam, Thailand, or Mexico on the box. I laughed out loud when the article mentioned the 100-400. A lens that I have tried about 7 copies and still did not find one worth keeping. I know I'm not the only one who feels that lens has myriad issues. I appreciate the article. Some good explanations of technical concepts. But it really seems like it was written by Panasonic's PR department. Was the author able to ask questions? Was the author able to to point to something and ask about that? Or was it like a public tour where the guide sticks to a script and keeps you moving along quickly? I know there may have been language differences and issues of propriety secrets. But I was really hoping for some good questions and honest answers. 1. purchased, had focussing issues, tight zoon. Returned for repair and provided with a refurb. 4. Didn't fit, zoom tolerable. Refunded. Took money to local store. This info is provided to show that I did not order seven copies and send them back. I tried a variety of sources over several months with a couple of different Oly bodies, hoping to get something that would be fun to use and produce good images. Interesting. I've never had any trouble putting any lens on my Oly bodies. But I haven't tried this one. If I decide to get one, I'll sure give it a thorough once-over before I buy it! I was able to ask questions and tried to focus my article on answers to the questions, rather than the generic 'here's how you make a lens' presentation that's been told before. However, I've only had limited experience with the 100-400 and don't remember having any problems with it, so I wasn't in a position to challenge them on it. That said, I've never encountered a lens that doesn't fit on a camera body (and I use a unusually large number of lens/body combinations in this job). Are you sure the mount on your camera hasn't been damaged? It's a lens with tight tolerances. Could it be that your mount was deformed? All the photographers I know with this lens are pretty stuck on it. HRC2016 described many problems with his lens, its possible of course but I think it was maybe broken lens, and not some general problems with this lens, some my friends use this lens and I also tried it during the few days, absolutely no problem and its a great lens, I think. I am not Panasonic user but this kind of problem with lens can be happen with any lens by any manufacturer, for example, during the transportation, jump, etc. Also, Ruairi said right, problem can be with camera mount or with camera. Quaint that polishing is done by hand. I think the best (though not most consistent, with higher rejection rates) results are currently still achieved by hand. Note that it's polishing of the dies and moulds that's done by hand. I think it's interesting that they can still get the best results in some areas by old fashioned methods. Not looking good - I see chromatic aberration in the picture "Lens elements about to be coated by vapor deposition" and corners are not sharp at 400%. Other than that, good article. The difference between corporate propaganda and journalism would be if we were given insight into why Panasonic can make its own lenses but sometimes grams that out to Sigma, while making lenses for a Leica and who else they make for. Yeah I'm a little confused too as to which Leicas have Panasonic lenses and which have actual Leica lenses, IIRC it used to be that non-S and non-M would be all Panasonic (after the end of R) but somewhere down the road it got more mixed up. Companies in all industries partner with other companies (including competitors) with complementary technologies. Not surprising that they would not share such sensitive information. The journalist!s job is to dig. The PR agent job is to tell you only waist the company wishes you to know. This then is PR masquerading as journalism.. They can spout out whatever they want about sensors or internal components (if they're even discussed in detail) and it's almost always taken at face value. I'm not pointing fingers but when it comes to GPUs, phones, SSD, and other gear there's usually a lot more in depth analysis. It may have benefited the camera companies in some ways (not many shrinking markets support 3-6 mayor players) but it's always bothered me. I blame the artsy/subjective side of the business, which smacks of the audio world where you can get away with a lot more ambiguity. Very nice and interesting article! Well done! "Having been rushed through the factory, there was one area we weren't allowed to visit. This is essentially a mirror-image of the areas I was shown, but all working for another, unspecified client. Something to consider, next time you see the phrase 'Made in Japan' on a lens you weren't expecting to see it on." Surely - My humble Leica Vario-Elmar-T 18-56mm, for the CL and TL says "Made in Japan". No surprise in that. I wonder what glass camera makers use and I believe the consumer should know to make informed decision. It is known Canon use fluorite. I'd be inclined to disagree. Lens designs end up using different types of glass for different elements in each lens. Canon uses fluorite glass for some elements in some lenses but generally the information given is more in terms of properties, rather than chemical composition (eg showing the positions of extra-low dispersion 'ED' elements in the diagrams of optical formulae). But, since most of us aren't lens engineers, it's nigh-on impossible to know whether the use of fluorite or UD or whatever elements is actually beneficial or not. At which point you just invite a marketing arms race in which every brand comes up with silly (proprietary) names for each type of glass and then try to make it sound as if it makes their lens magically better. This doesn't really provide anyone with any additional useful information. So while, on the whole, I'd say more information is generally a good thing, I'm not sure discussing glass composition would actually help inform anyone's decision. I think APO designation for lenses has the greatest meaning, since it has to at least be close enough to apochromatic to please the buyer. ED glass used to mean something in the late 80's, not sure if nowadays. Even the APO designation is abused often, since there's no strict criterion or organization to enforce it (I'm looking at you, Sigma from the 90's). After decades of dealing with Canon's poor QC on even their L glass it's comforting to see Panasonic concentrate so heavily on precision and QC. Impressive (and comforting) that every 100-400 zoom is individually calibrated and tested to that degree of precision. EDIT : Oh well we responded at the same time. Anyway there's a difference between what is claimed and what actually happens. It's unknown to which standard Panasonic's FF lenses will be made but let's hope that it won't be as bad as their m43 lenses. And FYI, price = / = sample variation. The Canon 50mm STM is pretty consistently made and costs peanuts. Looking forward to computational photography, eliminating the need for big, heavy, expensive lenses. Looking forward to computational forums that automatically eliminate trollish and/or "I saw it on the internet" posts. We're already halfway there: https://petapixel.com/2018/11/24/google-pixel-3-vs-sony-a7r-iii-a-low-light-shootout/ And the phone tech is surging forward much faster than camera tech. This Petapixel seems to be a photography-wannabe site, all their samples are heavily downsized without availability of the original, and I've seen them post many unprofessional, unsubstantiated comments. Looking forward to this as well... Already way behind. 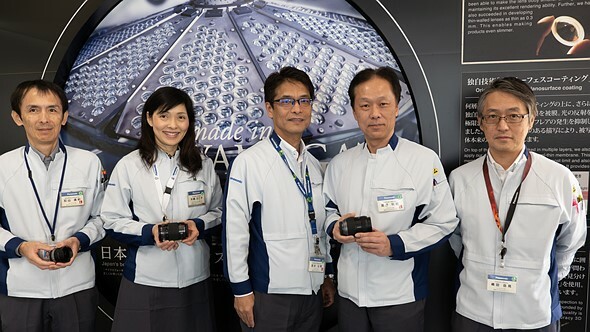 Great insight to the Panasonic lens factory. Thanks! Interesting to know the difficulties of making an aspheric element. Sony kind of has that achievement with the XA element molding technique, down to 10nm I think. Never take the lenses you use for granted! I’m curious to know why some lens elements are made from plastic. It doesn’t sound very appealing as a concept but I guess they must be OK.
Maybe Because Plastic can be made Clearer than Glass, Take Fiber optic for example. A very long run of optic cable (like the cable used to deliver fiber internet underground) is very clear from one end to the other. Maybe they can achieve diffraction that is not possible with Glass. The simple answer is that its cheaper to manufacture plastic elements. Acrilic is the most transparent solid matter known. It's easy to mold it, so all small lenses in smartphones are plastic lenses. I think size may have something to do with it, too (I think it's easier to make very small plastic lenses). I'll try emailing Panasonic and see what they say. Yeah, it's easier to make high precision molds for plastic than for glass. AFAIK, plastic lenses are beneficial. But cannot be made beyond some size. Why can't they make a plastic lens over a certain size? I wonder do plastic lenses have similar or perhaps potentially better performance? Could be why some smartphone lenses seem quite good. In many recent interchangeable camera lenses, plastic is used for aspherical elements. Because of the aspherical elements complex curves, its easier and faster (thus being cheaper) to mold a plastic lens, rather than to grind a glass one. While you can make aspherical glass elements, it takes precision and in some cases grinding by hand which takes a considerable amount of time and man power. Some plastics are actually molded onto a glass back. The plastic elements are as good image quality wise as their all glass counterparts. I just don't know about durability or longevity of those elements. Luckily, most plastic elements in interchangeable camera lenses are inside the lens body and not the front or rear element. Panasonic Lens Factory is tidier and cleaner than Nikon's Hikari Glass Factory. I think its because Nikon has been making lens for a very long time and often the Japanese prefer to stick to traditional way whenever they can. Whereas Panasonic is the newer kid on the block and thus having more modern equipment. It’s hardly a surprise. One makes raw materials, the other makes finishes products. Somewhat, but a factory that mixes and grinds raw glass is always going to look different to a facility which takes that raw material and processes it for use in precision instruments. If @ Mariano cared to look through our past articles he'd see images from my visit to Nikon's camera factory last August, which show a spotless production line. lester11 - What you say is true but I can vouch for the Panasonic images being representative of what the factory looks like. I had to wear a white coat, head cover and white slippers, even though I wasn't being taken into any of the clean-room areas (instead observing through windows). Panasonic makes good Leica lenses, too ! It's a confirmation that a good lens is a good lens no matter where it's made and these days, the prestigious brand name is there to justify the price and impress the customer. You mean this brand? https://www.dpreview.com/articles/3583146192/inside-nikon-hikari-glass-factory?slide=19 This factory is just grossly dirty. Yes, they have to wear masks and protective clothing so it will not contaminate lenses? Or, to protect themselves from the lenses. And like many excellent German lenses, gets glass from Hoya. German lenses made with Hoya glass? That's news to me... Both Zeiss and Leica source their blanks from Schott for the stuff that they build in Germany - of course, if you're also counting Cosina-Zeiss and Panasonic-Leica as 'German lenses', then yeah. Panasonic will surpass Leica & Zeiss in my opinion in 3 years as best lens maker in business. The S1 will be Camera of the Year unless Sony pulls a rabbit out of the hat. If they keep a more aggressive pricing strategy, otherwise if they rise in pricing to match Leica & Zeiss they may well find that the names of their peers have a value all of their own. So no, Panasonic has a ways to go. Sony GM lenses (the good ones) are already optically better than Panasonic's best. Indeed the S1 is an impressive camera. Um, perhaps in your opinion. Reviewers and users give high acclaim to Panasonic's lenses. Panasonic's lenses (setting aside some of the PanaLeicas) don't compete with the best from Leica and Zeiss. Now, not all Leica and Zeiss are always done bestest. Why would you "set aside" the Pana-Leica lenses when comparing to the best from Leica and Zeiss (or the Sony GM lenses you previously mentioned)? Wouldn't it make sense to compare the best Panasonic lenses to the best lenses from other manufacturers? After 10 years with MFT, I mostly prefer the Panasonic lenses over the Zuikos. There are exceptions, like the Zuiko 75mm and 8mm Fisheye, but the Panasonic 12-35mm and 35-100mm f/2.8 have little competition. If you think sharpness is the only thing that defines lens quality, you may come to a different conclusion. Then few lenses can compete with the Zuikos. @How Actually you’re 100% wrong! The new FF 50mm f1.4 is the best 50mm on the market hands down. Better than Leica! There was a time, before I was born, aspherical lenses were specialty lenses and expensive. Today, aspherical element in lenses is very common it doesn't cost anything anymore nor raise an eyebrow. Because the best from Leica and Zeiss are significantly better than ANY PanaLeica. So you can set them aside. On average, setting aside PanaLeica's, I've been more impressed with results from Oly, eg the f/1.8 25. But yes, it is true, I've not tried absolutely every Panasonic m4/3 lens. I've been impressed by some of the images from the new Panasonic S 50mm, but they were nothing extraordinary. And I've been disappointed by some samples from a different source. Here's a list of known to be extraordinary 50mm lenses for full framed: Leica Noctilux, Zeiss Milvus, and Leica 50mm f/2.0 APO. Nothing I've seen from any other lens maker comes close to any of these 3 in the 50mm range. I've only tried the new Panasonic S 50mm once, so can't really judge against the Leica SL 50. @HowaboutRAW - what are you basing your conclusions on? The Pana-Leica 200mm/f2.8 broke resolution testing records. It's near optically perfect. No one has done an in-depth test of the new S Pro 50/1.4, but its optical performance seems to match its price, exceeding the Sigma ART 50/1.4 and potentially putting it into the Zeiss Otus class...for nearly half the price and with autofocus, of course. Having samples from many PanaLeica lenses, including that 200mm f/2.8. Sharpness is hardly all that's important. As I said, I've seen impressive raws from the Panasonic S 50mm, I shot them, and I've seen less than impressive raws--those are the DPR examples. There's the Leica Noctilux, the Leica 50mm APO, and the Zeiss Milvus, all extraordinary. Well the best Pana lenses are designed by Leica, so I do not agree. It's just like Zeiss who designs their own lenses but let Sony and Cosina build them. Not really, more like Leica approved. Sony designs SonyZeiss lenses; Zeiss approves the designs. I'm not sure what all these generalisations are supposed to accomplish... Seriously, who buys a lens based largely (or even in small part) on the brand? I would hope anyone spending hundreds or thousands on a lens does it because it tested well, compares well with others, and/or has traits they find appealing. The fact that Pana started using PL on any semi premium lens is just kinda amusing, they basically gave up on their X branding, who cares tho? I bought an f/1.0 Noctilux without trying it, and without reading up on it. But that was back at the end of the film era and there was no mirrorless full framed (or APSC) digital body to try it on.